The Meertens Institute (Dutch Meertens Instituut) in Amsterdam is a research institute for Dutch language and culture within the Royal Netherlands Academy of Arts and Sciences (Koninklijke Nederlandse Akademie van Wetenschappen or KNAW). Its two departments are Dutch ethnology, focusing on indigenous and exotic cultures in the Netherlands and their interaction, and Variation, focusing on structural, dialectal, and sociolinguistic research on language variation within the Netherlands, with an emphasis on grammar and onomastic variety. The institute began in 1930 as a Dialect Office; the Folklore office was added in 1940, and Onomastics Office in 1948. These three bureaus came under the umbrella of the Central Commission for Dutch Social Research. The Secretary of the three bureaus, P.J. Meertens, was the first director and retired in 1965. The institute was renamed PJ Meertens Institute in 1979. In 1998 it was renamed as simply the Meertens Institute. Since 2001, the Institute also houses the Secretariat of the International Society for Ethnology and Folklore (SIEF). In September 2016 the Meertens has moved to the historic 'Spinhuis' building in downtown Amsterdam, jointly with the Huygens/ING institute for the history of the Netherlands (also a KNAW institute, coming from The Hague). The ethnology department is well known for its research in and databases on Dutch songs and folktales, pilgrimage culture and saint cults, probate inventories, farmhouses, feast and rituals and religious cultures. It supports also the research platform on alternative healing. Wikimedia Commons has media related to Meertens Instituut. The Royal Netherlands Academy of Arts and Sciences is an organization dedicated to the advancement of science and literature in the Netherlands. 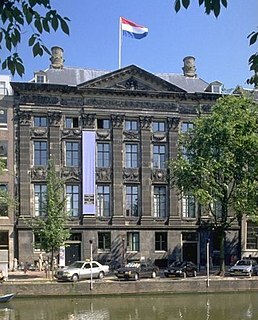 The academy is housed in the Trippenhuis in Amsterdam. The Dutch Language Union is an international regulatory institution that governs issues regarding the Dutch language. It is best known for its spelling reforms which are promulgated by member states, grammar books, the Green Booklet and its support of Dutch language courses and studies worldwide. It was founded on 9 September 1980 by the Netherlands and Belgium. Suriname has been an associate member of the Taalunie since 2004. The NIOD Institute for War, Holocaust and Genocide Studies is an organisation in the Netherlands which maintains archives and carries out historical studies into the Second World War, the Holocaust and other genocides around the world, past and present. The institute was founded as a merger of the Netherlands Institute for War Documentation and the Center for Holocaust and Genocide Studies (CHGS). The Netherlands Institute of International Relations Clingendael or Clingendael Institute is an independent think tank and diplomatic academy which studies various aspects of international relations. The institute is located in Wassenaar in Huys Clingendael, a 17th-century manor house which is part of the Clingendael estate. The Institute of the Lithuanian Language in Vilnius is a state-supported research organization that focuses on research into the Lithuanian language. Frans Van Coetsem was a Belgian (Flemish) linguist. After an academic career in Flanders and the Netherlands he was appointed professor at Cornell University in 1968, and consequently he emigrated to the US, where, after a few years, he chose to become a naturalized American citizen. The International Institute for Asian Studies (IIAS) is a global research institute and knowledge exchange platform, based in Leiden, the Netherlands. The Institute initiates and promotes interdisciplinary and trans-sectoral programmes that engage partners in Asia as well as institutes elsewhere in the world. So doing, the Institute aims to promote a more integrated understanding of present-day Asian realities as well as to pioneer new approaches to Asian Studies in a changing global context, and, more specifically, to contribute to new humanistically-informed and policy-relevant knowledge about Asia. The Biografisch Portaal is an initiative based at the Huygens Institute for Dutch History in The Hague, with the aim of making biographical texts of the Netherlands more accessible. Ineke Sluiter is a Dutch classicist and professor of Greek Language and Literature at Leiden University. Her research focuses on language, literature, and public discourse in classical antiquity. She was a winner of the 2010 Spinoza Prize. Antal P.J. van den Bosch is a Dutch language researcher. He has been director of the Meertens Institute since January 2017. He previously was a professor at Tilburg University and Radboud University Nijmegen.